Hi Everyone! How r U all today??? Fine fine ha! Gooood! 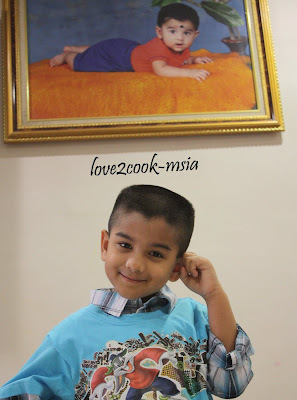 Well, like I've said before... we celebrated Rishie's Birthday at his kindergarten today! 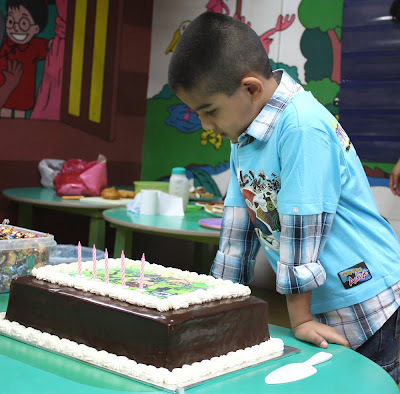 It was a new n joyful experience for Rishie as he cut the cake with the teachers and friends around him! Wow...cool kan! 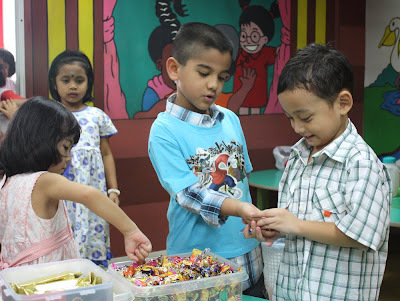 I replied, today is their last day of school for the year, so it's party day for them...therefore no uniforms required...hikhik! 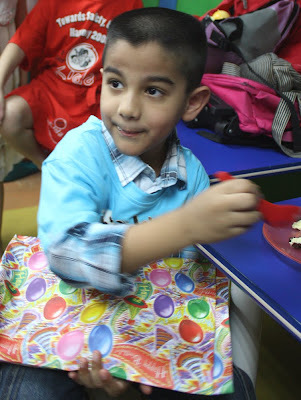 Rishie was so happy that he jumped n jumped when he saw me with a cake box! Surprise jadik finally! He jumped even higher after seeing the cake! 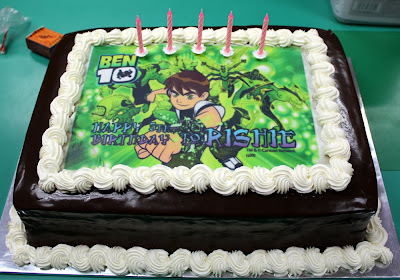 Well, that's his hero on the cake~ Ben10! All the kids (from morning and afternoon sessions) were there for the party...it was quite crowded, but the teachers really took control of the kids...uish memang kerja susah tuh! Respect the Teachers lor!!! 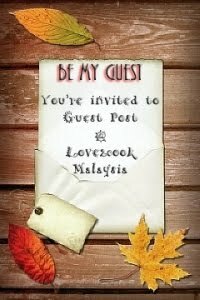 Actually I don't mind the kids la...they are kids, so mestilah bising2...run here, run there.. etc etc kan? 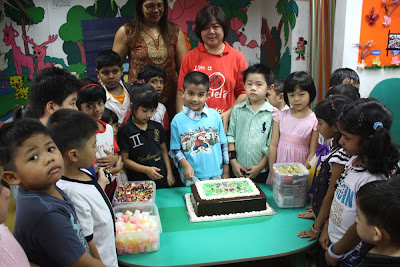 Anyways, Rishie finally cut the cake after a birthday song from his friends...owh so sweet la all of them! Came from various races...they were awesome! I saw One-Malaysia there! 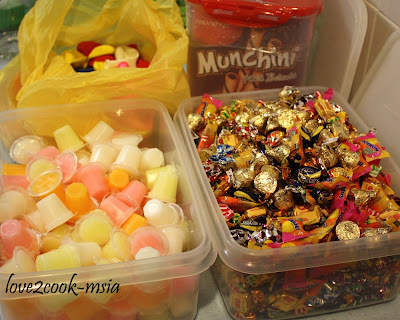 Some tidbits taken along...Jellies, chocs, sweets, biscuits and balloons! 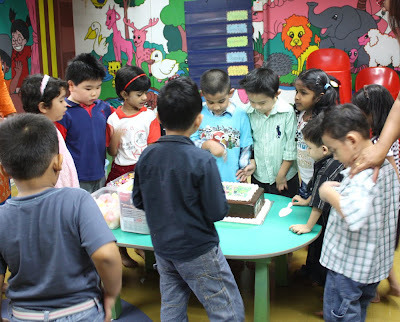 Rishie and gang having a look at the cake...semua peminat Ben10 kot! 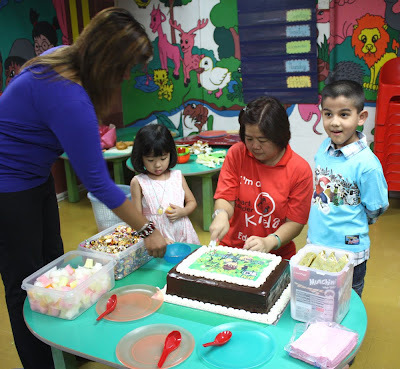 Rishie's class teacher Ms Lee cutting the cake to give away! 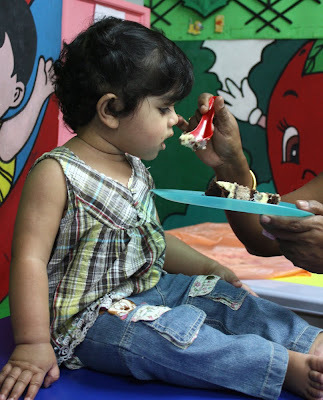 A piece of cake for Rishie! 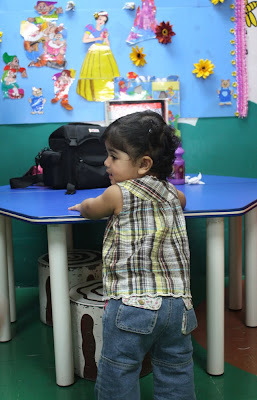 Children and Birthday....What a Moment...Glad you started blogging when your children are still small...for these are treasures of memories...which they could read back one day....! I am glad that I started...even it is a bit late...but its better late than never right! Sure you are really tired...and needed a good rest and bet Rishie must be smiling in his sleep ha!! 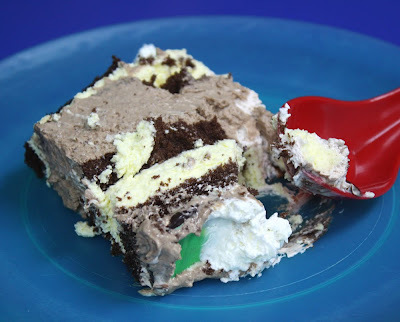 meriah nye..love..brapa ek harga kek SR sebesar tu? KakWatie ~~> Gud AM KakWatie! Yes kak...I'm happy coz I started blogging and I could treasure all my sweet memories in here for my kids to read later on, also for ourselves! Yes, it's better late than never! I agree!!! Yeah, I was terribly tired yesterday! Macam I yang potong kek n ran around! kihkih! 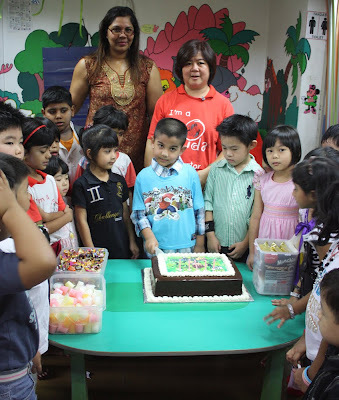 Ijan ~~> We ordered the cake bigger, so that every kid and teacher can have it! 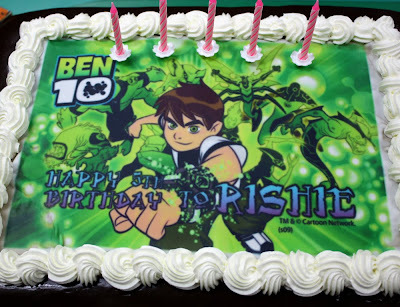 Rishie was overhappy not to see the size of the cake, but the Ben10 on it!kekeeke..
KakTinta ~~> Hehehe...tks for ur heartiest compliments kak! I'm so proud too...tks ya! 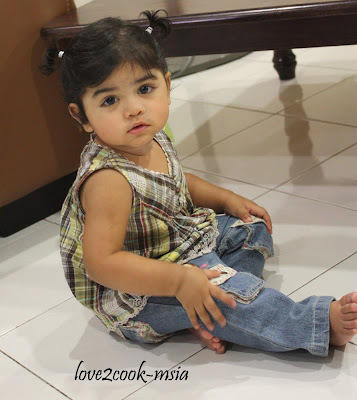 ashika sgt comel!! 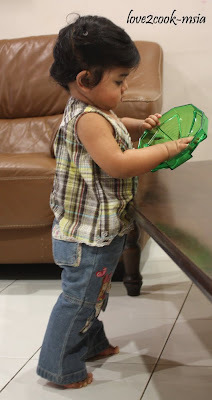 how i love baby girl..boleh main fesyen2..
you're awesome and i adore you, love. i am this type of person who will never failed to appreciate and adore the effort a mother is making...and i can see that you do. rishie and ashika are so lucky. i love what you did for their birthdays. After all we are doing that for our own kids...and we do not expect anything in return. 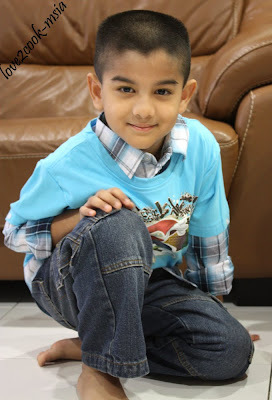 We are lucky to have such adorable kids too..hehex! Tks again for the compliments Sha! ;) So sweet of U! wahhh...meriahnyaaa!!! 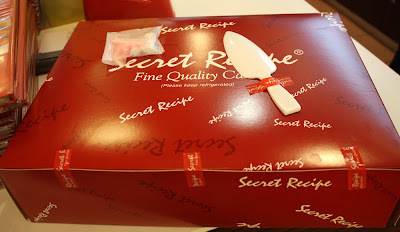 auntie nk sikit cake, ada lagi ke..???? Happy belated Birthday to Rishie...! Such a handsome young man.... Wow, so lucky to have big delicious Secret Recipe cake!